It seems Marshal General Baldwin Gearhart and his lackey, Mr. Clogg, wandered into a Crucible Guard camp the other night. 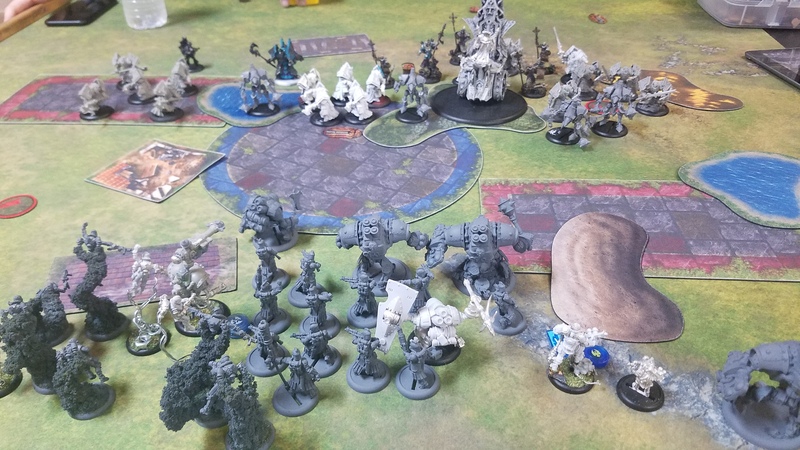 One thing leads to another, and he suddenly found himself leading a small CG contingent into battle against a Menoth Vessel of Judgement being escorted from a nearby temple to a village for a cleansing of souls. In Shreveport, our Menoth guy was mainly into Amon, and I had no idea what Durant could do. Spread the net, with two lakes, a house, rubble, burning earth, forest, hill, and trench. And as always… I hate 2D terrain’s looks, but it does make for a clean game, so whatever. I don’t remember if I went first or not because this was like a week ago. Looking at the photo though, I think I did go first. Normally I wouldn’t be concerned with that, but I think going first is what gave me an opportunity to take down the battle engine. Crucible guard warjacks ran up followed by the infantry. Menoth ran, and set Inviable Resolve on the bastions. It’s a nice change, fighting a slower army. Turn two was absolutely amazing for crucible guard. It took a while to figure out what to do in the early part of the turn because there were so many options available. The retaliator soaked bastions in oil allowing a suppressor to spray a few with fire before it sprayed the battle engine with rust. The Rocket Girl camped on the flag with several rocket men hanging out and blocking nearby. Crucible Guard infantry crowded the circle and blasted away at the bastions with combined ranged attacks using fire. They picked up some boosted damage. Some of the other crucible guard infantry who could not fire on the bastions managed to land some damage on the battle engine a little followed by a very good shot from each of the vindicators with two shots from Baldwin in order to finish it off. I honestly didn’t expect to finish the battle engine with Baldwin, so his first shot was intended to shadow bind it and then the second shot was just a follow up to see if I could do any damage. I spiked a boosted damage roll . Yay dice!When all was said and done, two of the bastions died along with the battle engine. Two of Menoth’s light warjacks charged in and waded through the crucible guard infantry. I don’t know if his objective was to clear a zone or just to get close to my warcaster. Between the jack and infantry, the Suppressor narrowly got destroyed. Another light warjack engaged the Vanguard andone of the Vindicators, putting the hurt on the Vanguard, knocking out his leftarm. A bunch of bastions try to take the circle, while the left group ofCinerators jam up the Rocketmen on the left. The Cinerators on the right hung out, wary of entering the fray. I think they may have been protecting the flag from Hutchuck. Menoth scored on their rectangle and flag, contesting mine with Cinerators and warjacks. I was a little worried at this point because, this scenario can run away if you let your opponent score early. My plan was to clear the light warjack in my rectangle, run or charge the Vanguard out to the Cinerators on the right in hopes of contesting that flag, clear the Cinerators on the left so I could score on my flag, and contest their rectangle. I figured Prospero could cast his exploding spell on the Vanguard to hopefully take out some dudes. At the end, I should be able to score 2 and contest his zones. I screwed up order of activation. I think it was the continuous fire that derailed me. It didn’t do damage, but it interrupted my thought process. Next time, I’ll write things down. Baldwin preyed the light, and shot at something (I forget what, and it didn’t really have an impact here). One of the Vindicators walked in and smashed the light jack. Prey moved to the next jack, which was promptly destroyed by the other Vindicator. Prey moved to Cinerators on the left. Rocketmen cleaned up those guys pretty well with grenades, then dispersed. Prey moves to the bastions. The damaged Retaliator tries to do something with the infantry, but can’t shoot while engaged, so it just weakly swung its little damaged pokey bit around. Infantry don’t do much due to positioning. Once they are engaged, they really become ineffective. Hutchuck ambushed, taking out Rhupert. Not bad, but not the best play. I scored two points, and he took one. In retrospect, Hutchuck should have ambushed on the right, to contest the flag. I did have other plans there, but those plans forgot about the rocketmen being able to reposition if given the proper orders. To win, Menoth would need to score 4 points. I couldn’t really see him clearing his rectangle, and he didn’t position his Cinerators to threaten my warjack on my rectangle. The most he could do is score 2 and work on the next turn, or go for an assassination. He went for the assassination. Menoth tried to make a final play, throwing a single light warjack onto Baldwin. The jack couldn’t pull it off. It is a dice game after all. He resigned from the game after the attempt, saying he didn’t feel he had enough to score or to handle the two heavy warjacks and the attrition game would be mine. Finally taking the time to look at Durant’s card, I notice that his feat really wants him to run a bunch of jacks. With one upkeep going and Focus 7, he can deal out 6 focus at the beginning of the turn, then feat to deal out another focus to each jack and pick up 7 if he has 7 jacks in range. He would have almost all of his jacks running full steam due to his feat. Flip back to the front, and he’s got Field Marshal: True Sight. He has jacks that can see through clouds. The Purifiers have both beatback and overtake – that’s best of both worlds! Beat back if you don’t kill them and overtake if you do! So that’s pretty sweet. But that’s not the point of the list. It looks like Durant can heal d3 points from friendly Faction models within 14” of him, the Vessel of Judgment can heal d3 damage points from friendly Faction models within 10” of it (while at the same time making enemy upkeeps expire unless a caster wants to suffer d3 damage), Rhupert can hand out Tough, Mechaniks can heal jacks or the Vessel d3+1, and the Bastions can Sanguine Bond some damage around to keep from dying. If I were to change this list, it would be to add a Castigator. Those fists are POW 16, Blessed, and it has Combustion for the low, low, low cost of 12 points. Combustion is amazing, and the DEF-skewing CG Rocketman’s worst nightmare. Thankfully, it’s only a speed 5 warjack and can’t do Combustion on a charge or trample. But it’s still effective at controlling a 7” swath. I wouldn’t want any of my guys there. From a Crucible Guard perspective, running into a healing list like this, the Retaliator becomes critical. Rather than using Alchemical Accelerant (oil), it should be throwing out Black Humor as much as possible for the Corrosion and Grievous Wounds. The Accelerant works well on the Exemplar Bastions, but not the Cinerators, Vessel,or Purifiers because they are immune to fire. I think my instinct was correct in taking out the big battle engine right away. Denying Menoth a key piece is always good. If I were Menoth, I would consider adding a shield guard or two as well, rather than going all in on those little chain ball jacks. I need to remember to bring a pad of paper to the store when I plan for the big turns. Crucible Guard is more complicated that the troll armies I am used to running, and honestly, I didn’t play Cygnar much differently either (Trenchers or Blades just run in and wreck stuff). Another thing I must work out is how to use ambush more effectively. If I already have a bunch of dudes ready to contest a zone, then do I really need to take out a solo with Hutchuck, or should he contest a flag instead? Had this game gone on a little longer, I guess I would have seen the result of Hutchuck ambushing the rectangle. He could have rusted that one little jack, and any remaining rockets could have finished it off. But why? Contesting is contesting at that point. Spacing the rocketmen out in the rectangle would have ensured no scoring there for at least another three turns. As far as my list goes, I found myself wanting at least one of the artillery units. Being able to strip off Rhupert’s Tough and reducing armor on Bastions seems legit. I also feel like the CG Infantry are extremely weak on the defensive. They can’t do anything if engaged, due to such a poor P&S on their swords. It’s odd, because their MAT is higher than their RAT, so they’re supposed to be better with swords? I’m not sure. With Trenchers, they did well enough on a charge, but I feel like these guys are more like the old Long Gunners (with better stats, obviously). They’re just a strange unit I haven’t figured out yet. I get that they’re supposed to be a ranged unit, and they have some flexibility with their shots, but the continuous effects are all crits. Maybe if I needed more magic guns, they’d be worth taking, but there aren’t any incorporeal-heavy dudes in my meta. Baldwin can give them boosted attacks, so there is that. I will probably buy max FA because of addictions, but they’ll most likely hang out on a shelf until needed.